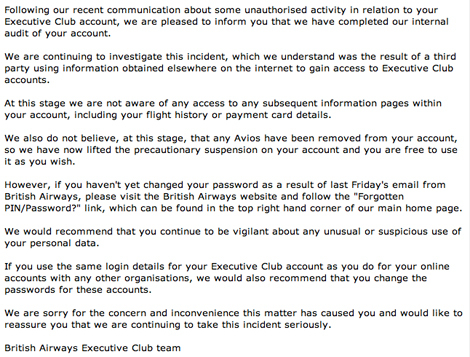 British Airways has confirmed that a small proportion of its Executive Club frequent flyer customers had their accounts hacked on March 29. The airline has however reassured its customers that no names, addresses, bank details or personal information have been accessed. It has also taken steps to lock down accounts that have been compromised. In a statement, a BA spokesperson said: “British Airways has become aware of some unauthorised activity in relation to a small number of frequent-flyer executive club accounts. This appears to have been the result of a third party using information obtained elsewhere on the internet, via an automated process, to try to gain access to some accounts”. A thread on the popular aviation forum FlyerTalk has seen numerous cases of lost points reported. While the airline has not confirmed if the perpetrators were able to steal any of its customer’s Avios, BA has suggested that the loss of Avios is most likely due to an internal audit whereby the company temporarily froze accounts to investigate the incident. While the airline has identified most of the compromised accounts, members are still advised to change their account passwords as a security measure.